Airway inflammation, especially neutrophilic airway inflammation, is a cardinal pathophysiologic feature in chronic obstructive pulmonary disease (COPD) patients. The ideal biomarkers characterizing the inflammation might have important potential clinical applications in disease assessment and therapeutic intervention. Sputum myeloperoxidase (MPO) is recognized as a marker of neutrophil activity. The purpose of this meta-analysis is to determine whether sputum MPO levels could reflect disease status or be regulated by regular medications for COPD. Studies were identified by searching PubMed, Embase, the Cochrane Database, CINAHL and http://www.controlled-trials.com for relevant reports published before September 2012. Observational studies comparing sputum MPO in COPD patients and healthy subjects or asthmatics, or within the COPD group, and studies comparing sputum MPO before and after treatment were all included. Data were independently extracted by two investigators and analyzed using STATA 10.0 software. A total of 24 studies were included in the meta-analysis. Sputum MPO levels were increased in stable COPD patients when compared with normal controls, and this increase was especially pronounced during exacerbations as compared with MPO levels during the stable state. Theophylline treatment was able to reduce MPO levels in COPD patients, while glucocorticoid treatment failed to achieve the same result. Sputum MPO might be a promising biomarker for guiding COPD management; however, further investigations are needed to confirm this. Chronic obstructive pulmonary disease (COPD) is a condition of chronic airflow limitation that is not completely reversible and is often progressive . It is one of the leading causes of morbidity and mortality in the world, resulting in a growing social and economic burden . Airway inflammation is a cardinal pathophysiologic feature in patients with COPD , and assessment of airway inflammation may therefore play an important role in the management of COPD and assessment of the disease status and prediction of prognosis. Additionally, oxidative damage in the lower respiratory tract accelerates the development of COPD, and oxidative stress levels are elevated in COPD patients . Neutrophils are a major cellular component of COPD inflammation . The number of neutrophils is increased in induced sputum and bronchoalveolar lavage fluid (BALF) of COPD patients, and correlates with disease severity [1, 5]. Usually, the markers such as myeloperoxidase (MPO), interleukin-8 (IL-8), leukotriene B4 (LTB4), and human neutrophil lipocalin (HNL)  are used as the mediators of neutrophil activity. According to the Food and Drug Administration (FDA), ‘With the exception of lung function tests, there are no well validated biomarkers or surrogate endpoints that can be used to establish efficacy for a drug for COPD . The marker MPO has been systematically studied in an attempt to determine if it is an effective biomarkers for COPD. Myeloperoxidase (MPO) is a heme-containing peroxidase expressed abundantly in neutrophils and to a lesser extent in monocytes . MPO is one the principal enzymes released from secondary granules following neutrophil activation [9, 10]. Although the generation of oxidants by MPO is beneficial in terms of the immune response to invading pathogens, there is considerable evidence that inappropriate stimulation of oxidant formation can result in host tissue damage. Sputum derived from the surface of the lower respiratory tract mucus is a direct sample from the lower airways, and analysis of sputum composition makes non-invasive measurement of airway inflammation possible. Therefore, sputum MPO may be a potential non-invasive biomarker that reflects the severity or prognosis of COPD. Conventional pharmacotherapy includes bronchodilator medications (β2 agonists, anticholinergics, and methylxanthines) and inhaled glucocorticosteroids (ICS). These can improve health status, and reduce symptoms and exacerbations . However, previous treatment has not been shown statistically to decrease mortality [11, 12]. Novel anti-inflammatory therapies are therefore being developed as potential therapeutic agents, a recent study  showed that an MPO inhibitor is able to stop progression of COPD in an animal model by inhibiting oxidative damage. The inhibition of MPO may be a novel and useful therapeutic treatment for COPD . 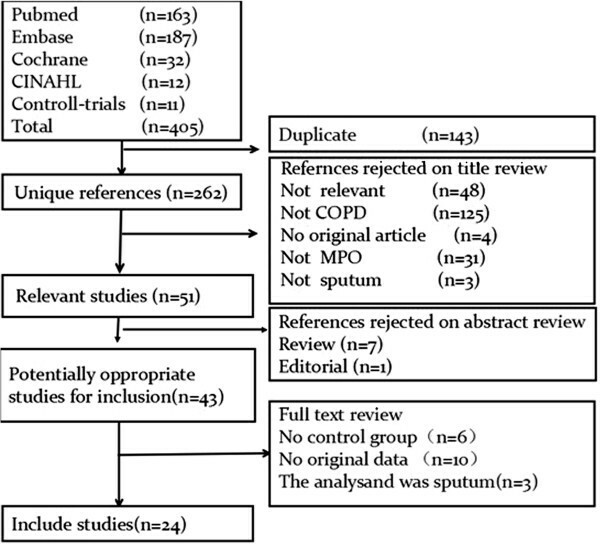 This is the first meta-analysis about sputum MPO in COPD patients. There have been many recent studies reporting changes in MPO level in COPD patients [14–19]; some of these studies failed to replicate the earlier results [15, 16]. And there were few studies that contained large samples. Other studies [20–26] also observed the changes of MPO level before and after anti-inflammatory treatment, but results were inconsistent. We therefore performed the first meta-analysis of published studies examining sputum MPO in COPD patients to determine: 1) whether the MPO level is increased in COPD patients compared to healthy subjects or asthmatics; 2) whether there is a difference in MPO level between patients with stable disease and during acute exacerbation; and 3) whether anti-inflammatory treatment could reduce the MPO level. Studies were identified in literature searches of PubMed (1966 to September 2012), Embase (1980 to September 2012), the Cochrane Database (1972 to September 2012), CINAHL (1981 to September 2012), and http://www.controlled-trials.com for relevant reports. We used the following keywords: (sputum OR mucus OR phlegm) AND (myeloperoxidase OR MPO) AND (Chronic Obstructive Pulmonary Disease OR obstructive OR bronchitis OR pulmonary emphysema OR bronchial hyper-reactivity OR COPD OR COLD OR emphysema OR airway obstruction OR airway inflammation), without language restrictions. Additionally, a manual search was conducted using all reviews on this topic, which provided bibliographies of original reports. Inclusion criteria were: 1) observational studies or randomized controlled trials (RCT); 2) studies comparing MPO level in COPD patients with healthy subjects or asthmatics or themselves; and 3) participants were adults with COPD as diagnosed by GOLD  or the American Thoracic Society or European Respiratory Society (ATS/ERS) standards . Exclusion criteria were: 1) the MPO value in disease was provided without control values [28–33]; 2) the study did not produce original data [34–42]; or 3) the study investigated sputum MPO but not in COPD patients [43–45]. Two reviewers (AZ and DG) independently scanned the titles and abstract sections of all the articles retrieved based on the explicit criteria. Full articles were searched when the information met the inclusion criteria. Disagreements in extracted data were resolved by discussion with a third review author (XY). Quality evaluation was conducted for each randomized controlled trial (RCT) with the Jadad criteria . The trials with a score of 3 to 5 were enrolled in our study. For each accepted study, we extracted the following data, when available: the number of participants (n), age, gender, clinical features, treatment (s), method of sputum sampling, method of MPO measurement, MPO value. 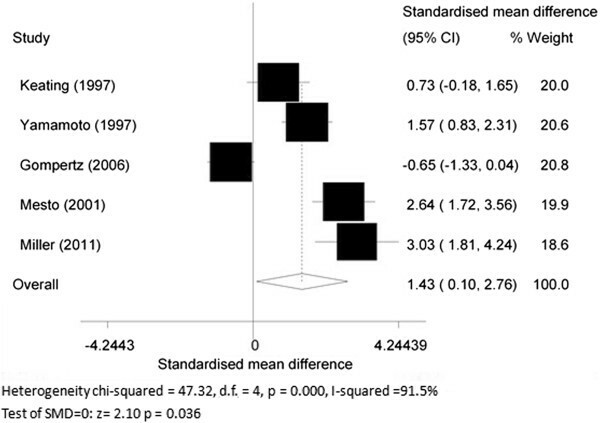 The MPO value was presented as mean value or standard deviation (SD), standard error of the mean (SEM), 95% confidence interval (95% CI), median or interquartile range and the percent predicted values of FEV1 (% pred FEV1) in each group. The SEM or 95% CI was transformed into SD, using a statistical formula. If the study provided medians and interquartile ranges, we imputed the means and SDs as described by Hozo et al. . We calculated the lower and upper ends of the range by multiplying the difference between the median and upper and lower ends of the interquartile range by 2 and adding or subtracting the product from the median, respectively. If the article provided an MPO value in chart form, we used the Engauge Digitizer 4.1 software to estimate its value, and then calculated the mean and SD with SPSS software(Version 16.0, SPSS Corporation, College Station, Chicago, USA). For articles where data were not complete, the authors were contacted. Subject characteristics are given in more detail in Additional file 1 [see Additional file 1: Table S1-S3]. Analyses were performed using STATA software (Version 10.0, STATA Corporation, College Station, TX, USA). 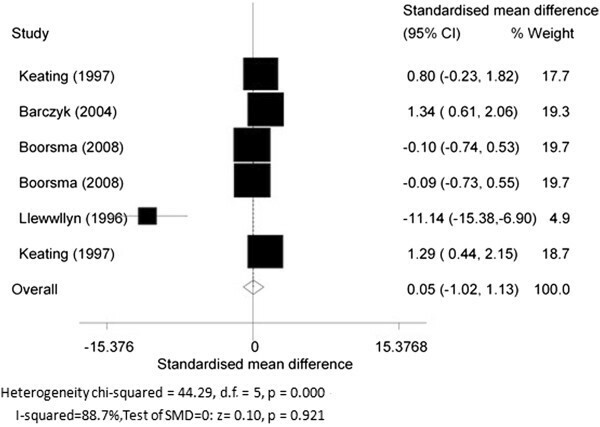 The standard mean difference (SMD) was chosen to combine statistics because the difference in mean value was too large and resulted in large heterogeneity. Summary estimates and the weightings for each outcome were evaluated based on the DerSimonian- Laird random effects model. Heterogeneity of study results was tested using the Mantel- Haenszel method, and results were considered heterogeneous if the P value was <0.05. We used the I2 statistic to measure the level of statistical heterogeneity for each outcome . We used a fixed effects model when I2 was equal or less than 50%, and a random effects model when I2 was greater than 50%. 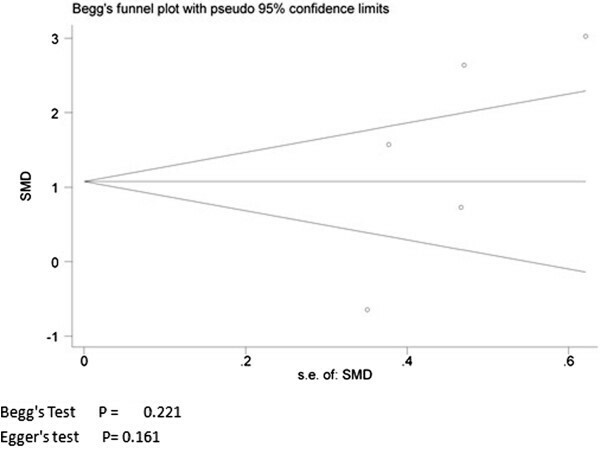 Publication bias was evaluated through visual inspection of funnel plots, using the Begg’s test  and the Egger’s Asymmetry test . Publication bias was assumed to be present if the P value was less than 0.05. In the primary literature search, 405 records were identified, of which 262 were unique. After screening the titles and abstracts, 219 studies were excluded because they were either animal studies, review articles, or irrelevant to the current analysis, yielding 43 candidate studies. Of the 43 reports selected for detailed evaluation, 19 studies were further excluded for various reasons (Figure 1). Finally, 24 articles were included in our meta-analysis. Among the 24 studies, three directly provided SD, nine studies used the SEM. We transformed the SEM from these nine studies into SD. Four studies used medians and the other four studies provided interquartile ranges, with the one remaining study providing 95% CI. We inputted these into SDs. In addition, we used the Engauge Digitizer 4.1 software to estimate the MPO value, and then used SPSS software to calculate the mean value of the MPO level in the other three studies (data are presented as mean ± SD). All studies provided basic information and detailed methodology for patients and controls. The characteristics of these studies were listed in Additional file 1. There was no evidence of publication bias (Begg’s Test: P = 0.221; Egger’s test: P = 0.161). The Funnel plot is shown in Figure 2. MPO levels in COPD patients and healthy subjects. Data were extracted from five articles [14–16, 51, 52] focusing on MPO levels in COPD patients compared to healthy subjects. The overall SMD of MPO levels was 1.43 (95% CI 0.10 to 2.76, P = 0.036; I2 = 91.5%; random effects model). COPD patients showed higher sputum MPO levels as compared to healthy subjects (Figure 3). Myeloperoxidase (MPO) levels in chronic obstructive pulmonary disease (COPD) patients and healthy subjects. MPO levels in COPD patients and asthmatics. Four articles [14, 15, 17, 51] compared MPO levels in COPD patients with asthmatics. The SMD of MPO levels between the two groups was 0.34 (95% CI -0.31 to 0.99, P = 0.301; I2 = 73.7%; random effects model). There was no statistically significant difference between COPD patients and asthmatics (Figure 4). Myeloperoxidase (MPO) levels in chronic obstructive pulmonary disease (COPD) patients and asthmatics. MPO concentrations in stable COPD and during acute exacerbations. Six articles [18, 19, 53–56] focused on the difference in MPO levels in stable COPD patients and patients with exacerbations. Five of them compared the MPO levels within COPD patients before and after exacerbation, while the remaining study compared MPO levels in COPD patients with those in healthy controls. Therefore, the former five articles were chosen for subgroup analysis. 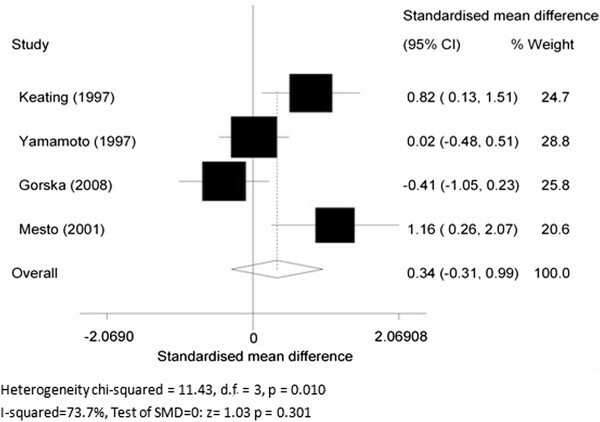 The overall SMD of MPO levels was 1.06 (95% CI 0.17 to 1.95, P = 0.019; I2 = 90.6%; random effects model) between the stable COPD group and exacerbation group. COPD patients with exacerbation showed a significantly higher MPO level than stable COPD patients (Figure 5). Myeloperoxidase (MPO) concentrations in stable chronic obstructive pulmonary disease and during acute exacerbation. The changes of MPO level before and after theophylline treatment. Three RCT articles [20–22] compared changes of MPO levels before and after theophylline treatment. 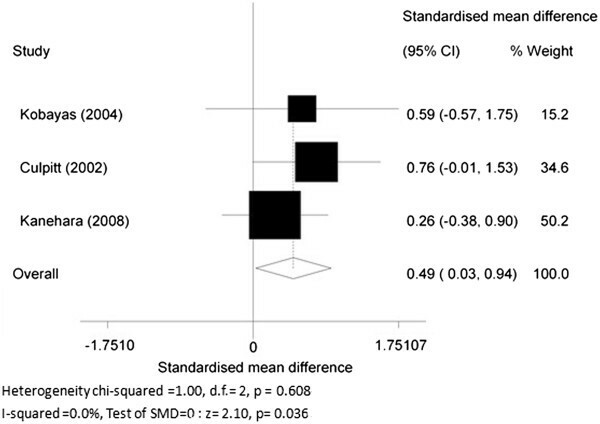 The SMD was 0.49 (95% CI 0.03 to 0.94, P = 0.036; I2 = 0.0%; fixed effects model), indicating theophylline treatment could reduce MPO levels in sputum of COPD patients (Figure 6). The changes before and after theophylline treatment. The changes of MPO level before and after glucocorticoid treatment. Four RCT articles [23–26] studied the effect of steroid treatment (including inhaled and oral corticosteroids) on the sputum MPO value. The SMD of MPO in COPD patients before and after glucocorticoid treatment was 0.05 (95% CI-1.02 to 1.13, P = 0.921; I2 = 88.7%; random effects model) indicating that glucocorticoids had no effect on MPO levels in sputum of COPD patients (Figure 7). The changes of myeloperoxidase (MPO) before and after glucocorticoid treatment. The changes of MPO level before and after other treatments. Gompertz et al. and Gronke et al. showed a small decrease in sputum MPO level in the patients treated with LTB4 receptor antagonists on sputum MPO levels in COPD patients. And the difference had no statistical significance (P = 0.06). The other three studies [44, 59, 60] also showed no difference in patients treated with macrolide antibiotics and tulobuterol. The changes of MPO levels between COPD patients with and without homozygous (PiZ) α1-antitrypsin (AAT) deficiency. Data were acquired from three articles [16, 53, 61], where COPD patients without homozygous (PiZ) α1-antitrypsin (AAT) deficiency were compared with COPD patients with AAT deficiency. 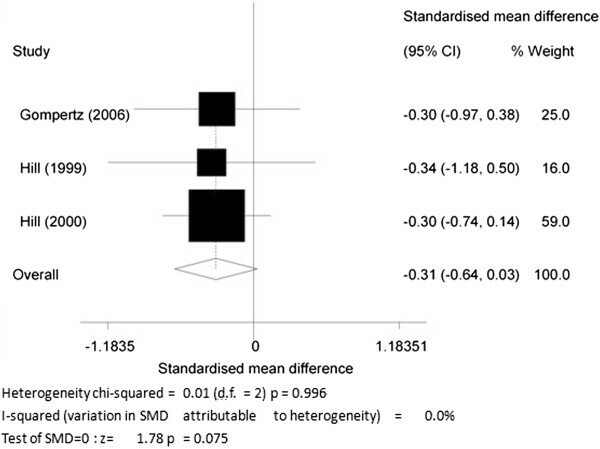 The overall SMD was -0.31 (95% CI-0.64 to 0.03, P = 0.075; I2 = 0%; fixed effects model) (Figure 8), indicating that there was no significant difference between the two groups. The changes of myeloperoxidase (MPO) levels in chronic obstructive pulmonary disease (COPD) patients with and without homozygous (PiZ) α1-antitrypsin (AAT) deficiency. 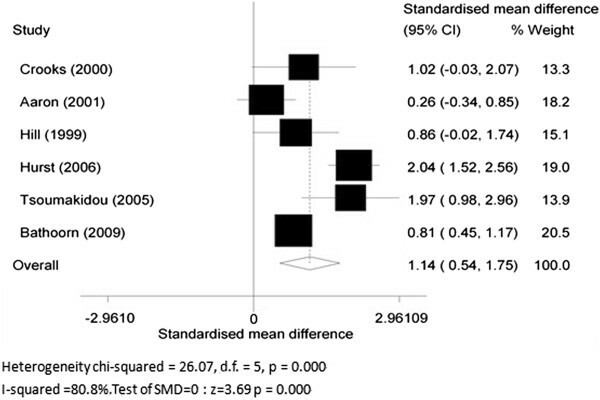 This meta-analysis demonstrated that sputum MPO levels were significantly increased in stable COPD patients as compared with normal controls but not different from those seen in asthmatic subjects (P = 0.301). It also indicated that MPO levels were also markedly increased during exacerbations compared to the stable state. Theophylline treatment significantly reduced sputum MPO levels, while glucocorticoid treatment had no effect. In addition, the COPD subjects with AAT deficiency appeared to have higher sputum MPO levels than those with normal AAT, although this did not reach statistical significance. The elevation of sputum MPO levels in COPD patients correlated with the increased number of neutrophils in their respiratory tract , indicating that neutrophil activation was associated with degranulation of the primary and secondary granules. MPO is considered to contribute substantially to the microbicidal activity of neutrophils and monocytes through the generation of reactive oxidant species . In particular, the combination of MPO, its substrate hydrogen peroxide (H2O2), and a halide results in a powerful and effective antimicrobial system . MPO has also been implicated in the induction of lung injury. For example, while the infusion of glucose oxidase or peroxidase alone produced little damage in in vivo studies, the combination of the two resulted in interstitial fibrosis . MPO release results in increased amounts of H2O2 induction, which is compatible with the MPO system playing a role in epithelial cell injury in man . As such, MPO has opposing roles as an effective antimicrobial which can, to some degree, be replaced and as a detrimental agent that has the potential to produce damage and contribute to disease . Perhaps, interventions that reduce MPO level might be anticipated to modify the progression of COPD. It is known that inflammation seen in asthma is different from that seen in COPD with inflammation from asthma being predominantly eosinophilic rather than neutrophilic bronchitis . As such, the levels of sputum MPO in COPD patients was higher than that in asthma patients. However, the difference was not significant, and the results may suggest that activation of neutrophils may also occur in asthmatics  or that the presence of chronic expectoration in COPD patients may complicate sputum analysis. Of course, more research and further work in this area is needed. Our study has shown that COPD patients with exacerbations had elevated sputum MPO levels relative to their clinically stable state. This is consistent with the fact that COPD exacerbations, especially in bacterial exacerbations , are triggered by neutrophilic inflammation . Apart from the study of Fens et al. , which suggested that there was no significant difference in sputum MPO level between GOLD stage I and II, few studies have investigated whether MPO levels are associated with disease severity. Further studies are required to determine this. Previous studies showed that theophylline induces neutrophil apoptosis through adenosine A2A receptor antagonism  and by reduced O2- production in both granulocytes and eosinophils . Liboshi et al. suggested that long-term treatment with theophylline reduced inflammatory cytokines and neutrophils in the sputum of COPD patients. Theophylline, therefore, has an inhibitory action on airway inflammation, particularly in relation to the activation of inflammatory cells including neutrophils. This may explain why theophylline significantly reduced the sputum levels of MPO in COPD patients. Interestingly, glucocorticoid treatment was found to have no effect on sputum MPO level in COPD patients, regardless of the route of administration and dosage, which further demonstrated that airway neutrophilic inflammation is not responsive to glucocorticoids . Although clinically, some COPD patients could benefit from glucocorticoids, it might be due to the inhibition of the ‘eosinophilic component’ of the inflammatory process in the airways by glucocorticoids . This may explain why COPD patients with neutrophil inflammation do not respond well to steroids. This may also explain the discrepancies between different studies regarding glucocorticoid effects in the treatment of airway anti-inflammation in COPD patients [71, 72]. More recent laboratory studies suggest that low-dose theophylline may reverse steroid resistance by enhancing decreased histone deacetylase (HDAC)-2 activity . However, no study confirmed whether combined medications could affect the MPO level in COPD patients. More translational research in this area is clearly required. Two studies [57, 58] determined the effect of oral leukotriene B4 (LTB4) receptor antagonists on sputum MPO levels in COPD patients. Gompertz et al. showed a decrease in sputum MPO level in the patients treated with BAYx1005, perhaps because LTB4 can induce the migration of neutrophils into the lungs  and play a role in leukocyte degranulation . But this failed to achieve statistical significance. Furthermore, the reproducibility of repeated measurements of MPO in the Gronke et al. study was also less than satisfactory. These data failed to demonstrate that sputum MPO levels, and by implication, airway inflammation in COPD are modulated by LTB4 receptor antagonists. Two additional studies [59, 60] evaluated the anti-inflammatory effect of macrolide antibiotics on sputum MPO levels in COPD patients. The course of treatment varied from 10 days to 12 months. There was no significant difference in sputum MPO levels regardless of the duration of treatment. In addition, Kanehara et al. also demonstrated no significant effect of tulobuterol on sputum MPO levels in mild-to-moderate COPD. Overall, these data suggest that only theophylline has a consistent effect on sputum MPO levels. Larger studies will need to be performed to determine whether other anti-inflammatory agents affect sputum MPO. COPD subjects with AAT deficiency appear to have higher sputum MPO levels, probably because these patients may associate with a general increase in the concentrations of several neutrophilic airway inflammatory parameters. Hubbard et al. suggested that alveolar macrophage release of LTB4, the major chemoattractant responsible for the increased neutrophil migration, is increased in AAT deficiency as a result of free elastase activity . The latter can reduce the secretion of secretory leukoprotease inhibitor (SLPI) , as well as the increase in the permeability of airway cells. However, recent studies have indicated that the relationship between LTB4 and MPO is less clear . No statistically significant difference in the sputum MPO level was observed between COPD patients with AAT deficiency and those with normal AAT levels in our study. However, more studies are needed to confirm this. Our meta-analysis has some limitations. The most obvious one is that the methods of collecting and treating sputum varied in different studies, and the few studies available prevented subgroup analyses. Another major limitation is the lack of standardization of sputum MPO measurement. The MPO level or its activity was assessed by radioimmunoassay (RIA) or enzyme-linked immunosorbent assay (ELISA) or the substrate O-dianisidine dihydrochloride assay, so the difference in mean values was large, resulting in a large heterogeneity, and we failed to perform the metaregression because of few studies. Ideally, further large-sample studies are needed to address the role of MPO in COPD patients. Our study showed a higher MPO level in the sputum of COPD patients compared with control subjects, especially during exacerbations. Theophylline decreased sputum inflammation, especially neutrophilic inflammation, which was accompanied by a decrease in sputum MPO level. Further investigations are needed to determine whether sputum MPO levels alter according to disease severity. MPO might be a potentially useful non-invasive biomarker of estimating airway inflammation in guiding COPD patients’ treatment. The sputum MPO level will contribute to assess the occurrence of any exacerbations. The inhibition of MPO may be a promising therapeutic treatment for COPD. Alling Zhu, Dehai Ge contributed equally to this work. We thank Rongbin Yu, Jianling Bai for their suggestions and comments during the meta-analysis process. This study was supported by the National Major Scientific and Technological Special Project for ‘Significant New Drugs Development’ (2011ZX09302-003-02), Jiangsu Province Major Scientific and Technological Special Project (BM2011017), the Priority Academic Program Development of Jiangsu Higher Education Institutions (PAPD, JX10231801). The authors declare that they have no competing interests. All authors read and met ICMJE criteria for authorship: AZ, DG, XY and MH participated in the design of this study; AZ, XY and JZ extracted data; AZ, XY, performed the analysis; AZ wrote the first draft of the manuscript and XY, IMA and PJB critically revised the manuscript. All authors read and approved the final manuscript.